Necessity is the mother of invention, which I guess makes desperation its sister. The Guardian reported recently on the emergence of new currencies in Greece brought on by the recession: things are so bad people are desperately trying everything from barter to time based currencies in order to meet their needs for food and basic services. The Greek government has even given them the all clear in terms of tax exemptions. But we don't have to do these things out of desperation. As I noted before, Ireland could become a global centre of excellence in the development and implementation of new currencies. I've recently joined the Feasta Currency Group which is supporting The Liquidity Network: who in turn are dedicated to finding new ways to resource economic activity in Ireland beyond debt-based/euro financing (since there isn't much of it around). As the euro crisis worsens (we're only in the eye of the hurricane at the moment) then expect to see a flowering of community-based, local schemes that aim to kick-start local (and even French city) economies rather than wait for Brussels and Berlin to solve things. One brilliant example of how we could take the lead in Ireland is a proposal from L. Randall Wray who suggests we start an Irish job guarantee scheme which pays its participants in punt. In other words, create a parallel currency (and supporting infrastructure such as shops that take them in payment), without, of course, leaving the euro (or exacerbating the government's budget deficit). 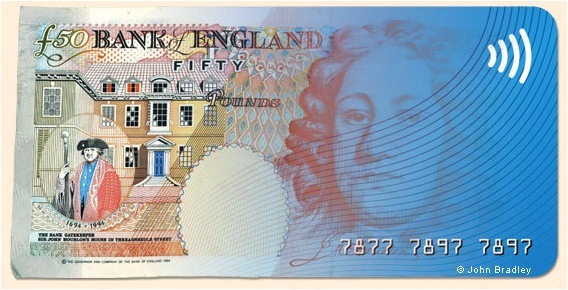 Though it might also be handy to have the 'parallel punt' up and running in case we actually do leave the euro. Finally, there's another reason to support a flowering of new currencies: the increasing shift away from cash to digital payment systems is creating new threats to our privacy (even the Financial Times is worried). With governments the world over desperately seeking more taxes (Italy's is using citizen's credit card details to see if they are spending more than they are 'earning'), then expect to have fewer euro in your purse or wallet (or bank account). We now live in the post-nationalist, post-Christendom, post-Enlightenment, post-modern world. A whole worldview has gone, and we are far from sure yet what is replacing all these ‘posts’. And we may well be living now in a post-capitalist world, just to add to the uncertainty and the vulnerability. We are on a different planet from that of the Covenant in 1912 and the Rising in 1916. It is the angst, the insecurity and uncertainty, the fears around living in this ‘post’ 21st century world that might drive some to commemorate Covenant and Rising as the recovery of some paradise lost, some imagined identity, some lost power base or shattered dream. So commemoration is getting back to the past, or an interpretation of the past, a re-enactment that looks back to a romanticised past, recovering a paradise lost, which is really a desperate attempt to allay our angst, fears, insecurities and uncertainties. And such commemoration may become aggressive, militant, a show of militarism. 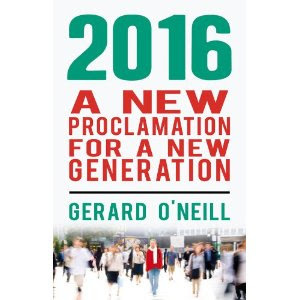 The text of his talk is here, by the way - ht Slugger O'Toole. 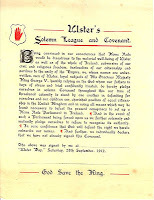 There is a new website dedicated to the Ulster Covenant, created by PONI: the Public Record Office of Northern Ireland. You can search the names of all those who signed the Covenant in September 1912 - there are even 360 O'Neills on the list! 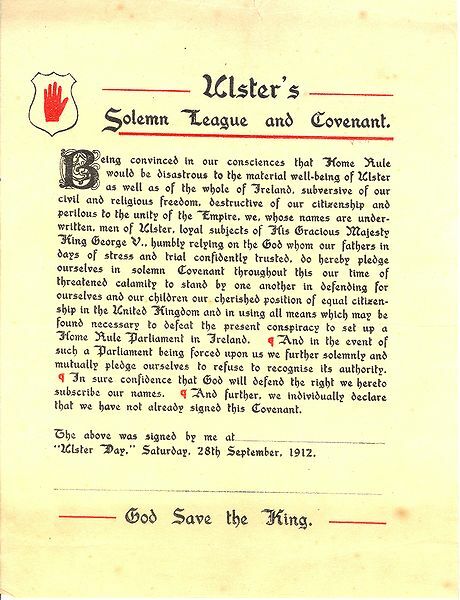 What is also interesting is the number of signatories from outside Ulster who signed the Covenant, in places such as Dublin and even Scotland. A reminder of how there was once a 'United Ulster' before partition. Dr McMaster is also Reverend McMaster and the second part of his talk is about the wider meaning of Covenant in a Judeo-Christian context. He speculates about the possibility for a new convenant for both parts of the island based on an emphasis on God rather than guns. Though to be honest his proposals read more like a mildly left-of-centre political manifesto than anything that will inspire half a million people to gather together and sign (in some instances in their own blood - though apparently only one man did that). I look forward to further debates about the relevance of 1912 - and 1916 - to our collective future in months and years to come. It is just one year since Japan suffered a terrible earthquake and tsunami that killed an estimated 20,000 people. As well as a nuclear accident that killed... nobody. 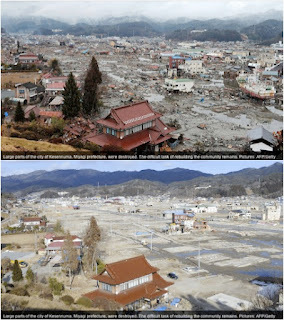 The BBC has a fascinating photo montage of different scenes from the devastation immediately after the earthquake/tsunami, and how they look today, 12 months later. It is a remarkable testimony to the resilience of the Japanese people. They are an inspiration to us in Ireland as we face far less challenging obstacles on the road to our national recovery. These are tough times to be a student. It was pretty tough when I was a student, but at least there were fewer of us competing for jobs when we graduated. 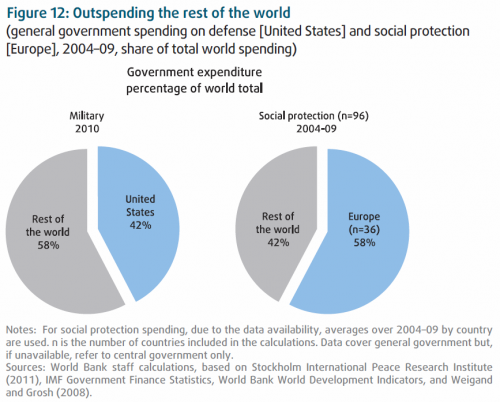 But now it seems we are living through a student bubble (in most of the developed world) and the results are not pretty. 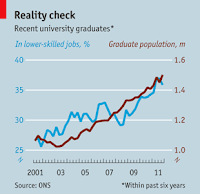 Nearly four in ten recent UK graduates are working in lower-skilled jobs (i.e. : ones they could have gotten without going to university) - image from The Economist. A percentage that has risen in lockstep with a near 50% increase in student numbers in ten years. In the United States, yet another spectacular debt crisis is bubbling up thanks to student loans - rapidly on their way to a cumulative $1 trillion. We've been spared the worst of this in Ireland thanks to 'free' third level education (or middle class social welfare if you prefer). Though we have not been spared the declining 'return on investment' to university education now evident in the UK. Peak Academia may be at hand. Beyond gender inequality, the real issue is the impact on those now approaching retirement. The pay-as-you-go ponzi scheme state pensions schemes in place throughout most of the developed world mean that those retiring need the young to keep earning. The plan was that more graduates would mean higher salaries would mean higher tax revenues would mean sustainable pension entitlements. It hasn't worked out that way. In the United States they are already talking about inter-generational conflict as the retiring Baby Boomer generation fights over a shrinking economic pie with younger generations. Here in Ireland we can at least avoid the inter-generational conflict for a while longer. Though how we increase the return on investment in third level education (for students, taxpayers and those about to retire) remains far from clear. I was asked to speak yesterday at Accord's conference in Belfast: they started out there fifty years ago. I'm a big fan of Accord - they are the frontline defending and supporting marriage culture in Ireland. No easy task nowadays. Thank you for inviting me to participate in Accord’s Golden Jubilee Conference. It is a great honour to be here. I should begin by saying that I am speaking here in a personal capacity, not in my role as Chairman of Amárach Research, but merely as someone who deeply respects the work of Accord and who shares many of your concerns about what is happening to marriage in Ireland. So I wan to share with you my personal views on the future of marriage. I truly admire Accord not only because what you do is vitally important – but also because what you do is brave. Perhaps it wasn’t so brave 50 years ago – though no doubt it was difficult – but it is certainly brave today in the face of new and often hostile forces arrayed against marriage as an institution and preferred choice in the early 21st century. Though I realise I should be careful about mentioning hostile forces in case the same forces decide to report me to the local Gardai – or PSNI station – for incitement! Nevertheless, I want to be brave this morning by looking ahead to the next 50 years for marriage in Ireland. ‘Brave’ because any conjecture about the future – be it the next 5 months never mind the next 50 years – is more than usually difficult at the moment! But also brave because more than ever we must be clear about what we want for our society, for our families and for future generations, rather than simply projecting into the future that which we merely expect will happen. He was right of course. History matters because it shapes the present, and because our present will one day be our descendents’ history. Yet too often it seems to me that those who have influence in the present –politicians, economists, policy makers or church leaders – are often remarkably ignorant about history. In the sense that they ignore history to their and to our detriment. So before I look ahead to the next 50 years for marriage in Ireland, let me look back over the past 50 years to the changes that have occurred and to the present we have arrived at in 2012. What have been the big changes to marriage and family life over the past fifty years? There are too many to reflect on all of them in this short talk, so let me highlight the ones that I think matter most – especially with regard to the future. Firstly, let us look at the incidence of marriage. One measure is the marriage rate , that is: the number of marriages in a given year divided by the total population. Back in 1962, when Accord began, there were 7 marriages per 1,000 people in Northern Ireland; in the Republic of Ireland there were just over 5 marriages per 1,000. Fast forward fifty years and the marriage rate in the North has fallen from 7 to 4.5 marriages per 1,000 population, and in the South from 5.2 to 4.6 per 1,000. Indeed, the marriage rate peaked in both the North and the South during the late 1960s/early 1970s, falling steadily thereafter but levelling off over the past 10 years or so in both jurisdictions. Of course, the fact that Accord got under way in the 1960s should not be adjudged a cause of the subsequent peak and decline in the marriage rate – correlation is not causation and all that! 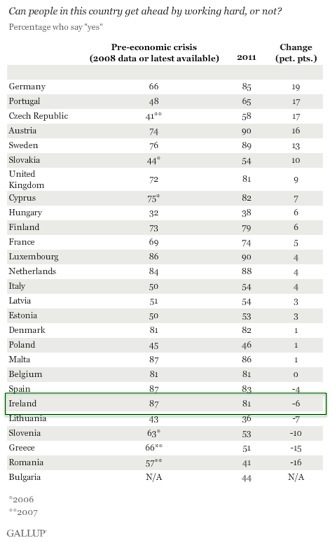 To put Ireland’s marriage rate in a European context, Cyprus currently has the highest marriage rate at 7 per 1,000; Slovenia has the lowest at 3 per 1,000. 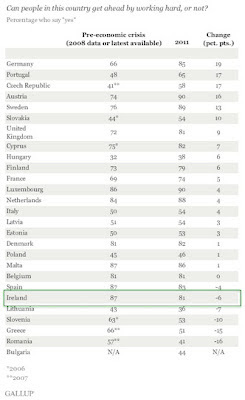 But trends in the marriage rate paint only a broad picture of what has happened to marriage in Ireland. The rate is a function of both the number of marriages and of the total population – so a surge in the population of children might actually deflate the rate, even though the surge might actually be a consequence of a growing number of marriages! As it happens, the annual number of marriages has, in recent times, been quite steady in Northern Ireland – at about 8,000 per annum over the past ten years – as has the number in the Republic of Ireland – at about 21,000 per annum on average, even rising slightly over the same period. What else can we say about marriage trends over the past fifty years? • Brides and bridegrooms have gotten older – the average age of men and women getting married for the first time has risen by about seven years over the past twenty years: from an average age of about 25 (North and South) to about 32 nowadays. • Churches are still the most popular locations for weddings: though their share has fallen from 95% of weddings in the South fifteen years ago to 75% today; and from 84% of weddings in the North twenty years ago to 69% today. • Catholic weddings are still the biggest single category of weddings in both the North and the South by method of celebration – accounting for over 70% of weddings in the South, and 36% of weddings in the North (civil weddings are the second highest in the North at 31%). Beyond trends in marriage, what have been the biggest influences on family life over the past fifty years? Again there are many, but two stand out in particular – births outside marriage, and the trend in the actual number of births. • Back in 1962, fewer than 3% of births were outside of marriage in Northern Ireland and the Republic of Ireland – today, the proportion stands at 40% and 34% respectively (it’s well over 50% in Ireland’s cities). • In a European context, the North is above the EU average of about 38%, the South is below – with in the rate today varying from a low of 7% in Greece to a high of 64% in Iceland. I say ‘alarming’, by the way, because the life prospects for a child born outside of marriage (to a single parent or even to a cohabiting couple) are worse on virtually every single measure we can derive than are the prospects for a child born to a married couple. Not for every child everywhere, of course, but for the vast majority consistently over the past fifty years. We have every cause to be alarmed. • There were 25,000 births in the North in 2010, and 74,000 in the South: the North is down from its historic peak of 33,000 in the early 1960s – though the South is back to numbers last seen in the 1890s! • In the past fifty years, the birth rate (births per 1,000 population), has fallen from a peak of 23 per 1,000 in the North to 14 per 1,000 today; and in the South from a peak also of 23 to a rate of 17 per 1,000 today (though a bigger population actually means numerically more births). That’s a little bit about where we have come from since the establishment of Accord fifty years ago. I’ve shared a lot of facts with you. But what about the future? Should we simply extrapolate the past fifty years out to the next fifty years – or is the task more complex than that? I don’t have any facts about the future for you – because there are none! The future doesn’t exist other than as a mental construct. And one thing we know from neuroscience is that whenever we think about anything, including the future, reason only accounts for a tiny fraction of the process – the rest is emotional. Which is why I say that ‘the future is emotional’ – we imagine it based on feelings, though we might explain it with a high degree of post-rationalisation. So let’s start in the present with the forces I believe will – one way or another – shape the future of marriage in Ireland and everywhere else for that matter. But note, I don’t offer forecasts or prophecies: only a ‘story’ that may or may not come true, perhaps all of it or just some of it. 1. Peak Government – we are living through an epic economic crisis not only in the UK and Ireland, but throughout Europe and the developed world. 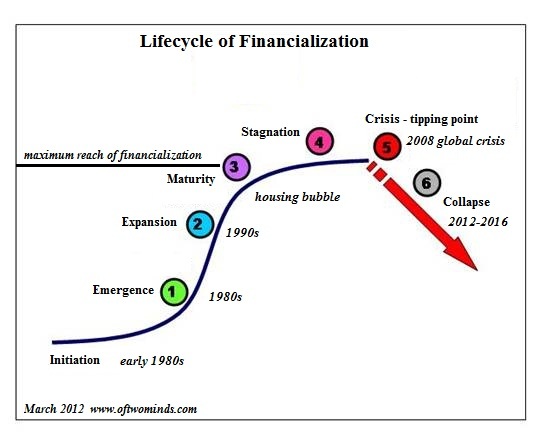 That crisis has flowed from the finance and banking sector on to governments through sovereign debt. The bottom line – a growing number of governments will be unable to fund their financial commitments into the future and so their spending will have to be cut. Drastically in some instances. We’re already familiar with Peak Government in both parts of this island. What’s the connection to marriage? It’s very simple: in many parts of the world the Government has become the ‘daddy state’ – replacing fathers and husbands with expanding social welfare provisions. But the ‘daddy state’ is about to become the ‘miser state’ – and so the dependency culture that was allowed to grow up around the expansion of profligate state spending will have to rapidly go into reverse. Again, just like peak oil, the transition to life after Peak Government will not be smooth nor trouble free. 2. Peak Feminism – this is probably a more controversial one! Second and third wave feminism expanded rapidly throughout the second half of the twentieth century, especially in the Anglophone world, on the back of economic, cultural and technological changes. First wave feminism wanted equal citizenship for women – the right to vote at the beginning of the twentieth century. Second wave feminism wanted equal economic access for women – the right to paid employment, from the middle of the twentieth century. Third wave feminism wanted, and wants, much, much more, namely: the transformation of society to the detriment of men. In case you haven’t noticed, feminism is no longer about equality. Of course, many feminists will deny this. They will point to the gender wage gap or other such controversies. But they then ignore gender gaps that are to men’s detriment, e.g. : higher rates of unemployment, of emigration, imprisonment, sucide, as well as greater victimhood from violent crime. Men are also failed by our educational system (a growing majority of third level/university students throughout Ireland and the developed world are women). Men still die five years younger than women on average despite all the advances of science in the past fifty years. The way I see it, many feminists talk about the glass ceiling, while conveniently ignoring the glass cellar that traps their brothers, fathers, sons and husbands (or should that be partners?) A Western culture sadly afflicted in the past by misogyny - the hatred of women - has now become one afflicted by a strident culture of misandry - the hatred of men. Both equally intolerable. But as Herb said, if it can’t go on, it won’t. The thing is, most of the ‘success’ of gender feminism in the late 20th century has been the result of substituting men with the state: as employer, provider and defender. Ergo, Peak Government means Peak Feminism. Again, it won’t be pretty after the peak has past. 3. Peak Individualism – my first two ‘peaks’ might be a tad controversial, but my third is probably more ‘philosophical’. Accord was launched in the early 1960s, at the start of a decade which witnessed an unprecedented global revolution in values, culture and behaviour. One person who captured the zeitgeist of the times was Abraham Maslow. Anyone who has studied psychology inevitably comes across Maslow’s Hierarchy of Needs. Security and sustenance are at the bottom of the hierarchy while self-actualisation is at the top (whatever that is!). All very hippy, all very self-centred, but a perfect charter for the radical liberal agenda of autonomy and individualism that has swept the world over the past fifty years. And also very wrong: we now know that the deepest psychological drivers of people relate to bonding, parenting and belonging. I believe we are living through Peak Individualism: the 1960s tide is going out, carried on the ebb of Peak Government and Peak Feminism. Our culture of radical individualism is also ebbing because of our ageing populations; the emergence of new types of communities and networks; and the resurgence of an older, deeper wisdom about what makes life meaningful and worthwhile. And it isn’t self-actualisation. 1. Men must have a purpose – unemployment among young men on this island, and throughout the world, is the biggest threat to the future of marriage bar none. It is also the biggest barrier in the way of our future wellbeing as a society and as an economy. No civilised society can survive without the engagement, commitment and support of its young men. And right now we are failing an entire generation of young men throughout the Western world. Nor will men be civilised without the pre-requisites that historically have given them purpose and identity, namely: a job, a wife and a child – preferably in that order! 2. Women must ‘woman up’ – we are all familiar with the call for men to ‘man up’ when the circumstances call for it. We’re less familiar with the call for women to ‘woman up’ – but I’d suggest we’re going to need to hear it more often. Just as civilisation has no future without its men, so the family has no future without the engagement, commitment and support of its young women. Women have been profoundly misled by radical feminism, by the myth that they can be happy and fulfilled by a career that provides financial independence, making men and marriage optional. It doesn’t. Most mothers of young children realise this, of course, but they often realise it too late as they delay marriage and motherhood into their early thirties, and sometimes beyond, in the elusive search for a fulfilliing career. Take it from me, the age of the career is over (for women and men): we are now in the age of the permanent freelancer, and with it the end of retirement as the last lifestage for most people. We’re all going to have to work much longer as Peak Government means the end to the welfare state as we have come to know it. The bottom line is that the family will only be saved by young women realising that marriage and motherhood are more important than a career (though most will continue to work outside the home some of the time when convenient and worthwhile), and that perhaps their mothers were right – 25 is a better age to get started than 35! 3. Christians must go on the offensive – I’ve started on a controversial note, so I might as well finish on one! Fifty years is a long time for a human being (I know from experience! ), but it is a mere blink in historical time. Organisations like Accord, and institutions like the Catholic Church and the other Chistian churches can and should take a longer term view of the future. The Catholic Church in Ireland – and elsewhere – has been on the defensive these past few years. For obvious and deserved reasons. But you cannot build the future merely atoning for the past. Stronger, healthier foundations are vital – so you have to get rid of the rot. A process that seems almost complete to me. But after that, new structures must be built – and that takes vision and a compelling story about the direction we must go in as a society. Peak Government, Peak Feminism, and Peak Individualism will unleash new forces in the world, not all of them benign. But it will also open up new spaces for organisations like the Catholic Church and other faiths (including Muslims: Ireland’s third largest denomination after Roman Catholics and Church of Ireland members) to use their wisdom, authority and resources to provide guidance and inspiration through the turbulent times ahead. So to conclude, women and men in the 21st century are just like our ancestors in the 1st century – we have the same physical, emotional and spiritual needs, we just fulfil them differently nowadays. Marriage and parenthood are as relevant to our wellbeing today as they were fifty years ago – or 2,000 years ago for that matter. I believe marriage will be even more important to our wellbeing in the post-peak future we are entering. All of you here are part of something extraordinary: I think of Accord as like an ark, floating on a sea of change, and one that will continue to provide shelter, sustenance and support to tens of thousands of Irish men and women as we navigate the next fifty years and beyond in our marriages, families, and communities. God bless you in that vital task.